As Atlético Madrid prepare to take on Juventus, Zach Lowy, co-creator of Breaking The Lines, speaks to Euan McTear, author of “Hijacking la Liga: How Atlético Madrid Broke Barcelona and Real Madrid’s Duopoly on Spanish Football” and Spanish football editor for MARCA, about Atleti’s chances going into the tie. ZL: After an 18-game unbeaten streak in La Liga, Atlético have lost two straight matches this month: one to Real Betis, and one to Real Madrid. A few weeks before, they dropped out of the Copa del Rey to Girona. What’s the state of mind going into Atlético’s Round of 16 tie with Juventus? EM: I think their state of mind is that their season is now all based on this Juventus game. Beforehand, they were one of the favorites for the Copa del Rey, as they always are, they were in the La Liga title race, they were the closest challengers to Barcelona, and then they’ve had a few terrible weeks to start off 2019. All of a sudden, they drop out of the Copa del Rey on away goals against Girona–very unlucky offside goal ruled out late on from Santiago Arias. There were a few fine margins that went against them, and all of a sudden they found themselves out of the Copa del Rey. Similarly, in the league, they went to Real Betis. They could’ve gotten a penalty for a Zouhair Feddal foul on Álvaro Morata, probably should’ve been a penalty, and then eight minutes later at the other end, Filipe Luís gives away a penalty, Betis take the lead and hold on. We had the Madrid derby last weekend where a few marginal calls went against them, and all of a sudden, a couple of bad performances, bad luck, and now their season comes down to one Champions League tie against a team that’s probably one of the favorites to win the whole competition. ZL: What’s the difference between this Atlético side and Atlético sides past? Looking back to last summer, I really did think this was the first really good summer transfer window that Atlético had in a while. Despite a promising window, it hasn’t panned out that way, has it? EM: The interesting thing with the arrivals is that most of them are doing quite well. Gelson Martins wasn’t terrible, he just wasn’t given opportunities, and then he had to make way for Morata. I think they would’ve liked to keep him, but they had to clear a space to fit under the La Liga salary cap. With Arias, he’s become the starting right back, he’s looking quite good. Rodrigo has been fantastic; he had a small injury and his absence from the starting line-up in the Madrid derby was massive. Thomas Lemar is the big one that hasn’t really panned out, but that doesn’t mean it can’t work out in time. But when I look at the transfer window from last summer, the big thing for me is not the arrivals, it’s the departures. As much as players like Gabi and Fernando Torres were older and footballistically aren’t at the same level as the guys that came in, you cannot underestimate the significance that they had at the dressing room. All of the intangibles, these guys had it: they had the grit, desire, love that helped get Atlético over the line so often in the past. As much as they’ve been replaced by some very good players, they just don’t have that x-factor, that Simeone factor anymore, and I think that’s a big loss. ZL: With the Champions League Final being played in the Metropolitano, it seems there’s a bit of urgency to finally get this elusive trophy. Is there a feeling that this is last chance saloon for Atlético? EM: I don’t think so because the number of transfers they made last summer, it was such a big summer in terms of transition. I don’t think those in the positions of power at the club view this as a last chance season, I think they view this as a transition season: transition to a young group of players, transition to a slightly more attacking style. People always want Simeone to start playing Pep Guardiola football. That’s never going to happen, but little by little, Atlético are becoming slightly more attacking. I don’t think this is a last chance. A lot has been made of the fact that the Champions League Final is at the Wanda Metropolitano. Obviously, if they were to get there, they’d have a great chance to win it, but at the same time, not that many Atlético fans are going to find a way in. The way UEFA divides up the tickets, so many will go to sponsors, half of the tickets for actual fans will go to whatever team they would face, and half the tickets would go to Atlético fans. It’s not like you’re going to have the kind of atmosphere you get on a regular home day. You could argue they’d be very comfortable playing in the stadium, they know the stadium, but they’ve only been there for two years, it’s not like these players have been playing there for decades and know every blade of grass. Obviously, it would be great if they could win it at their home stadium, but I think they have almost as good a chance at winning it next year (in Istanbul) as they do next year. ZL: What are some players who you feel have underperformed this season? EM: There’s quite a few: Thomas Lemar is one of them. One of the things we have to keep in mind is that we shouldn’t judge him by his price tag: his price tag was always going to be very high, he’s just trying to adapt to a new style of play. He’s not necessarily the kind of player Atlético have had in the past, he’s a much more wide player than they’re used to. Atlético are used to playing a 4-4-2 and all four midfielders are central midfielders. Thomas Lemar’s not that, but he’s got to adapt, and Atlético have to adapt to him. I wouldn’t say he’s been a major disappointment, I don’t think he’s unsalvageable, but he’s not performed as people would have hoped. I think the big one has to be Filipe Luís. His form has gone off a cliff this year; fortunately, Atlético Madrid have Lucas Hernandez, who can also play left back, obviously won the World Cup with France in that position, but they’ve had so many injuries at center back this season that he’s had to play at central defense and Filipe Luís is a little bit exposed. That’s the two I would point out, which really hurts one side of the pitch when they’re both lined up on the left-hand side. ZL: Hernandez was of course linked to Bayern last month: do you see that deal going through this summer? EM: I think it could happen this summer. 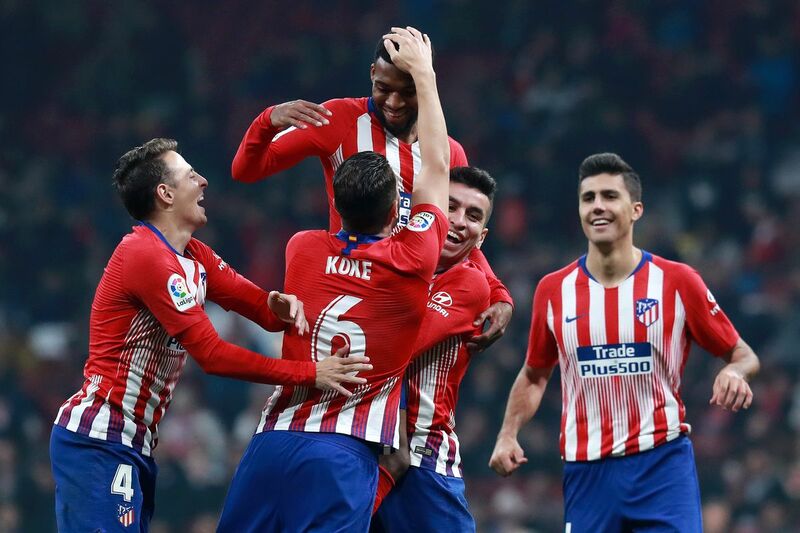 When it came out, Atlético Madrid were desperate to put it off to the end of the season, there were lots of reports that they got in touch with Bayern and almost made a veritable agreement that if they waited until this summer, maybe they could reduce the price a little bit. The €85 million was the fee in his release clause, but if Atlético were willing to negotiate a slightly lower fee with Bayern, he could leave for less and they get to keep him for another six months. I wouldn’t be surprised if he goes in the summer, but at the same time, maybe Atlético can convince him over the next six months that he is better off staying put. The same thing happened with Griezmann last year: around this time of year last year, Griezmann had his mind set that he was going to move to Barcelona. By the end of the season, his mind had been swayed and he decided to stay. Maybe Griezmann can be a part of that persuasion process, just like Diego Godín was key in persuading Griezmann to stay. ZL: It feels like we’re at a crossroads here. What’s your expectation going into this new era, and to start off, do you think Simeone will remain coach after this season? EM: I think he will [stay]. You always wonder how long he’ll be here: the fact that he’s changed his contract so many times, reducing it on occasion, extending it on occasion, you never know what he’s thinking. I think his mindset as well, sometimes he’s expected he would be gone within a few years and then decided he wants to remain. I think he’ll be there for next season. I think one day, not too far from now, he might leave, and that’s going to be the biggest hurdle that Atlético are ever going to face. I think they do have a serious problem going into next season: so many of the players we mentioned before, Godín, Luís, Lucas Hernandez, these guys might be leaving in the summer. This is a big problem for Atlético Madrid. They have more money than they’ve had in their history, they’ve been able to build up a reputation as one of the top clubs in Europe. The fact that all the discussions for a potential European Super League, the fact that Atlético is one of the names included in that discussion tells you that they’re now considered an elite European club at the top table. When Simeone took over, they were not that, they were a team that was just happy to be in the Champions League, they were probably Valencia’s level. They’ve now moved to a point where they’re the 4th-ranked team in the UEFA coefficient. They have lots of money coming from the Champions League and La Liga every year, they have the financial resources, they have the stadium, they have the platform to be able to consistently buy good players, talented players. The problem is that they might be buying slightly different kinds of players than they were used to, the guys we mentioned, more attacking players, many more foreign players without La Liga experience. I think you lose something: you may get better footballers, but you don’t have the same grit and determination that you used to have in the profile of an Atlético player. I think that’s a big problem they have in the next few years. I think they’ll be more talented, but I think they might not be as competitive. ZL: Is there any feeling that Atlético can revert to peak Cholismo against Juve, and tune it into the top level? Is there any way we can see the Atlético of 2014 against this Juventus team or do you feel like physically, it’s just not possible? EM: I think it is possible, and I’ll tell you why. On a consistent basis in La Liga, I think they just don’t have the profile of players to be able to play that aggressively and physically anymore, but they still have enough players who can step up on the big occasion on a European night. Last year in the Europa League semifinals against Arsenal, Vrsalijko got sent off after 10 minutes, and at the Emirates, under pressure, against the 11 men of Arsenal, they put in an absolutely fantastic performance. They dug deep, everyone gave everything they had, they managed to come back with the 1-1 draw. In the second leg, a big European night, they had a similarly combative performance and were able to pull it out. On a big European night, they still can raise the energy levels enough and do it, even from some of the players you might not expect it from. Griezmann, for example, is underrated in his fighting spirit. The amount of tracking back he does is phenomenal. His ability to execute a slide tackle is maybe one of the most underrated aspects of his game, we saw it with France in the World Cup, and they have other players like that. I don’t think Thomas Lemar is going to be getting into challenges and scraps in a La Liga match against Huesca, but when all the chips are on the line in a Champions League game against Juventus, even guys like this can step it up and do so. ZL: What’s your predicted line-up for the first leg? EM: Atlético have so many injuries all the time that it is quite hard to predict, but assuming there are no more injuries, I reckon the line-up will be Oblak obviously in goal. I think Arias would start over Juanfran, but that’s the position I’d have the most doubt about. I think center backs will be Godín and José María Giménez. Left back would be Lucas Hernandez. In the center of midfield, you’d have Rodri and Thomas Partey. You’d have Saúl and Koke in the wider midfield positions, and then you would have Griezmann and Diego Costa, if he’s back and fit and healthy, if not, obviously Morata. ZL: What have you made of Morata since joining? EM: He’s been really criticized but I don’t really get it. Atlético’s season has sort of collapsed because of one or two games and a couple of games which have been decided by one or two decisions. Morata’s start could have been so different: if that penalty is given to him against Real Betis, he’s a hero, he won the penalty that potentially wins the game. If he scores that goal in the derby, that lob which some images show he might’ve been onside for, he is the hero, he scores the equalizer in the derby against his former club. These two calls don’t go his way by millimeters, and all of a sudden people start to wonder what he’s done. He’s not in tune with his teammates yet, that’s to be expected. He’s not necessarily an Atleti kind of player anyway, and he only arrived 10 days ago, but I’m impressed. He’s had two big moments that were taken away from him, and if they had gone his way, we’d all be talking about what a great start he’s had. The margins are so fine–the width of a credit card could’ve changed the perception we have of Morata. ZL: What’s one player who needs to step up against Juventus for them to get a result and get through to the next round? EM: I’d say José María Giménez. When he plays well, when he plays at an elite level, that’s when Atlético get their famous results. Sometimes he can make mistakes, he can commit errors that can cost you the game. In the derby, he gave away the penalty for Ramos. It was debatable whether it was outside or inside the box, but it’s still a silly challenge to make. We’ve seen it in the past: he’s made mistakes against Bayern in the 2016 Champions League semi-final. He’s one guy that has a mistake in him, but when he’s in his zone and finds his zen, he can cut out every ball and be one of the best center backs in the world. If Atlético are going to win, he’s the guy that needs to step up. With Godín, you know the range of performance you’re going to get, with most players on that team you know the range you’re going to get, but I think Giménez’s range of great performances and bad performances, and it obviously needs to be at the upper scale of that range.